One of Georgia Democrat Jim Martin's ads bears a striking resemblance to an earlier ad by the Obama campaign. (CNN) - It's been less than three weeks, but more than $4 million has already been spent on the airing of campaign commercials in the U.S. Senate runoff election in Georgia, according to new numbers from the Campaign Media Analysis Group. 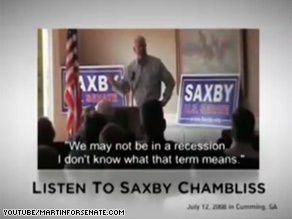 Republican Sen. Saxby Chambliss, will face off against Democrat Jim Martin, a former Georgia lawmaker, in a runoff election on Tuesday December 2, one week from today. The freshman incumbent won a plurality of the vote three weeks ago on Election Day, but Georgia state law calls for the winner to grab 50 percent plus one vote. Due to the inclusion of a third party candidate, Chambliss fell just shy of that threshold, forcing a runoff contest. According to the numbers from CMAG, Chambliss's campaign and the National Republican Senatorial Committee have spent just over $1.7 million in ad time since the day after the November 4 vote, with Martin's campaign and the Democratic Senatorial Campaign Committee spending more than $1.6 million. Outside groups account for the remaining $770,000 in campaign commercial spending. The vast majority of that money was spent by Freedom's Watch, a group that backs Republican candidates. "This shows that there is still a lot at stake, this run off is giving campaign '08 a final act. Who would have predicted this, a red state Senate race with groups from the political left free spending and groups from the right clearly not taking this for granted," says Evan Tracey, CNN's campaign media analyst and Chief Operating Officer of TNS Media Intelligence/CMAG. While he hasn't appeared in a TV commercial, Barack Obama is lending his voice to the Democrats' efforts to win back the Republican-held Senate seat in Georgia. The President-elect speaks out in a 60-second radio ad for Martin that hit the airwaves Friday. OMG – CNN just announced that Palin is coming. Next thing you know, they'll be sending the 2nd worst they have to offer – Palin! "Palin to hit campaign trail in Georgia"
To show you how much clout Chambliss has, ask him why DoD decided to close at least two military bases in the Atlanta area, Ft McPherson and Ft Gillem. Georgia military bases were off limits when Sen. Sam Nunn was there but oh how times have changed. Why on earth would Chambliss call on two losers, Sarah "no brain" Palin and Rudy "a noun, a verb, and 911" Guiliani to campaign for him? Sure Palin and Guiliani are high profile with name recgnition, but not for anything good. Could it be because they are both rabid, devisive, attack dogs? Ah! Undoubtedly, he is using them to remind the people of Georgia that racism is alive and well! That strategy didn't work for McCain; hopefully it won't work for Chambliss either. OBEY. CONSUME. WAR IS OK. WE ARE THE GOP. ALL HAIL THE HYPNOTOAD. Saxby got into office by using the dirtiest of political tricks against a true patriot. Time for this sleaze ball to hit the trail and crawl back under whatever rock he came out from. wow ..............do you need help...............................................oh well. Republicans better keep their guard up because this will surely be another election that the democrats will try to cheat and steal their way to victory. After his attacks on Max Cleland, it was hard to have any positive things to say about Chambliss. For that reason alone he should be removed. We don't need more sleaze. It's time to clean up congress. And yes right wingers, that DOES include William Jefferson. after voting for barack and getting hillary and team, instead, i dont think it will be a good idea to give the dems a filibuster-proof senate. what a strange country this has become. the media reports everyday about how much money is accumulated. his bio cliams he was a lifeguard and football player. WHO TOOK JOE BIDEN'S PLACE IN VIETNAM? WHO TOOK JOE BIDEN'S FATHER'S PLACE IN WWII. that's ride joe biden, sr was a draft evader in WWII.